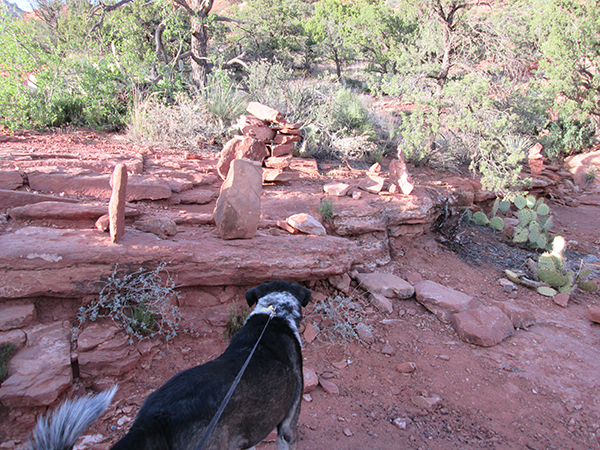 More rock piles on my trails. Right near the part of my trail that everybody passes by. They should leave the rock piles on the part of my trails where hardly anybody goes. Those rock piles keep multiplying. But here there are rock pile wars. Somebody puts them up – somebody takes them down. Rock piles don’t last long here. But it looks like someone worked hard to make sure these rock piles stay. That one pile has a double column of rocks. I’m getting a bad feeling about these rocks. I rarely growl, but these rocks deserve one. Just a low, quiet growl – enough to put those rocks in their place. And now I’m outta here. Carefully, so those rock piles don’t get suspicious. I went by that spot again the next day and the rock piles were gone. Up again – down again. Rocky hide and seek game? Karen, I think it’s a rocky up and down game. I found all the rocks – they just fell out of their piles. Rock piles cannot come and go.Those rocks were too big to move by themselves and somebody would have to be ever so strong to lift them up. I think….if you would like my opinion…..that these rock piles have something to do with those space people you discovered a few weeks ago….the same ones that left weird drawings. this needs detecting…hat on and at the ready!!!!! Patrecia, I’m reaching for my Detective Dog hat. Although if it’s aliens I might need my tin had instead. I have not seen your tin hat…is it your food bowl upside down !!!! Patrecia, I’ve never worn a tin hat but I’m thinking of getting one – or turning my food bowl upside down (there’s never any food in it anyway – well, maybe for a minute or two there is). All this evidence of aliens on my trails and you have to wear something to protect your head so they won’t invade your mind. Bacon, I hope Bigfoot hasn’t shown up on my trails. I already have enough trouble with aliens. Bacon, maybe I should be looking for Bigfoot on my trails. Bacon, I’ll be sure to send Tiny your way. Marina, I guess I told them. I bet they were so scared that they jumped back to the ground after I left. I hate when rocks come alive at night and start piling themselves up to become taller…. It’s scary. Be careful, B.
Cupcake, the rocks on my trails do have a mind of their own. At least it never happens when I’m watching. Now that would be scary. 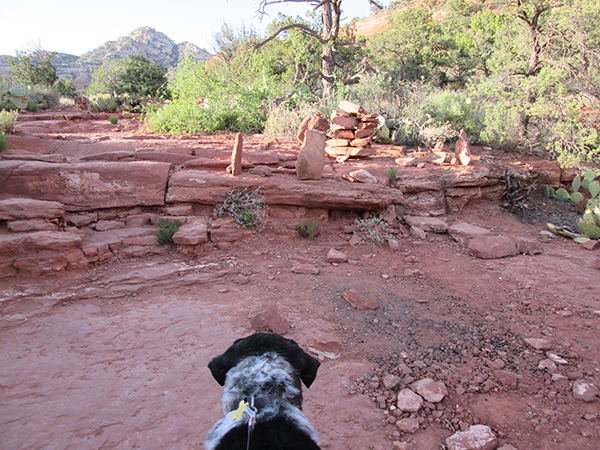 Lily & Edward, you have rock piles on your walks too? Oh no. This thing is getting to be an epidemic. Fredrieka, I think those rocks get in those piles on their own. I hope they don’t start throwing themselves next. That could be dangerous. chasing rocks would not be smart either..
Maybe I could talk those rocks into throwing balls for me. Hmmm…I hope those rock piles are never piled up again….and wars will be finished soon…. 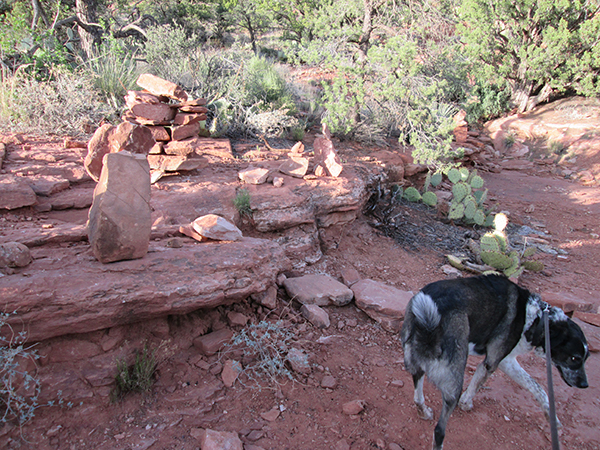 Kevin, I found a new rock pile on my trails today. I don’t think those wars have ended yet. You’ve scared the rocks away Bongo! But I’m sure they’ll be back…. Those rocks never seem to give up. My dogs get suspicious of funny-shaped objects too. Just the other day, there was “ghost” in the garden. Turned out it was a plant I had wrapped to protect it from the frost. But Tucker and Jasper both showed it who was boss. Susan, it’s kind of fun to show plants and creatures who’s boss. I bet Tucker and Jasper had fun with that plant. What on earth is going on on your trails??! Dalton, I think it’s an alien thing.